If, like me, you suffer from Menu Anxiety, where you just can't decide what to order, you will appreciate the French tradition of the Café Gourmand. I love it, and I don't even drink coffee. It is basically everybody's favorite dessert to order, and that's because you get not just one dessert, but many. It's the dessert for people who can't decide which dessert they want. This might help explain why English speakers think a "gourmand" is somebody who wants quantity of cheaper foods, whereas a "gourmet" it somebody who likes high quality foods. But actually, the French words "gourmand" and "gourmet" are not mutually exclusive. The better translation would be that "gourmet" is anything or anybody that has to do with high quality food (though the more current term is "gastronimie"), and "gourmand" simply means "sweet-tooth". Whether "gourmand" means "quantity" in English or "sweet-tooth" in France, the Café Gourmand is well-named. It's a very common choice on the menu, and it comes with a small cup of coffee (esperesso or cappuccino, that is) and a host of miniature, nearly bite-sized desserts. The desserts can be anything, as long as they're sugary: fruity, cakey, creamy, chocolaty, finger-food, spoon-required. But they're virtually never anything that must be served hot. Occasionally, an ice cream scoop will make its way on the platter. So what is a non-coffee drinking gourmet gourmand to do? We have found that with a polite smile, we will always be served our Café Gourmand with the café replaced by either tea or hot milk. Occasionally, the girls have even been offered hot chocolate, the assumption being that if they're ordering the Café Gourmand, they're probably happy to get even more sugar. We're not picky; we'll take any of those other drinks, and eat up all the desserts, too. The Mini-Clac is, in fact, a miniaturized version (I've heard it called "the little brother") of a Clacbitou, a goat cheese from Saône et Loire. It's about the diameter of a silver dollar or, for you non-Americans out there, a roll of scotch tape. The raw milk is turned into these little cheeses on various farms within a 50km radius of the affineur (cheese ager) La Ricotière who, in turn, takes them and is responsible for aging them for two weeks till the perfect, multi-color moldy crust develops. It's a thick, solid-creamy cheese that softens and melts in the mouth. The Mini-Clac has a big, earthy, goaty taste that hints of mushrooms in a cellar. By the way, the fact that it's related to a Clacbitou doesn't make it exactly the same cheese. Just the act of miniaturizing it affects the taste and aging. You have a different ration of crust; the interior texture is different; and sometimes with smaller cheeses, the interior flavors actually are more intense. The Mini-clac is the perfect little bite-sized nugget for a Café Gourmand. But you won't ever see it on a Café Gourmand plate, because cheese is most definitely not invited to that party. Café Gourmand treats are sugar only, and anything savory can just go find its own darn platter. What a wonderful blog ! On this specific post, I absolutely must ask you a question : where did you have the fabulous "café gourmand" on the first picture ? On a other subject, I am delighted to see that you have added "anonymous" to your comments listing, and I intend to use it regularly . This particular tray is from the restaurant Le Syracuse in the town of Chablis in Bourgogne. It's not the fanciest restaurant in town (which has some really fancy restaurants, thanks to the fame of the wine), but it's charming and delicious and perfect when it was just me and my two girls for lunch. 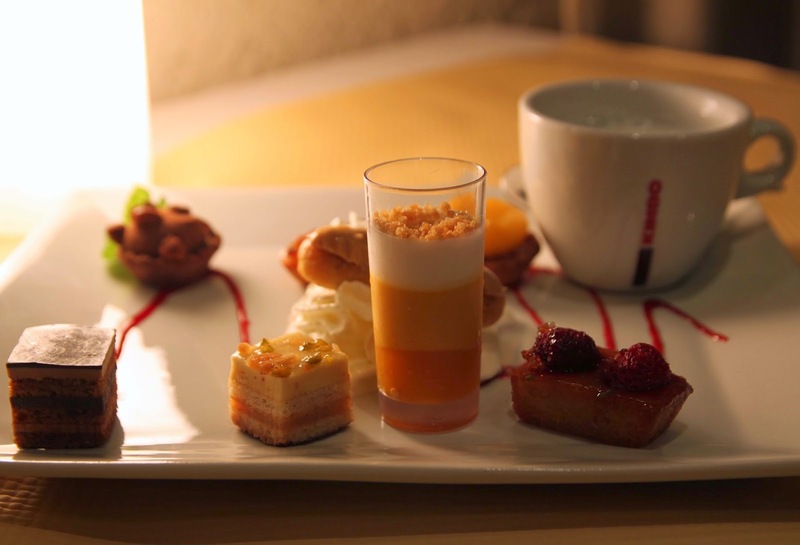 And yes, this Café Gourmand really won us over!